Happy Thanksgiving! 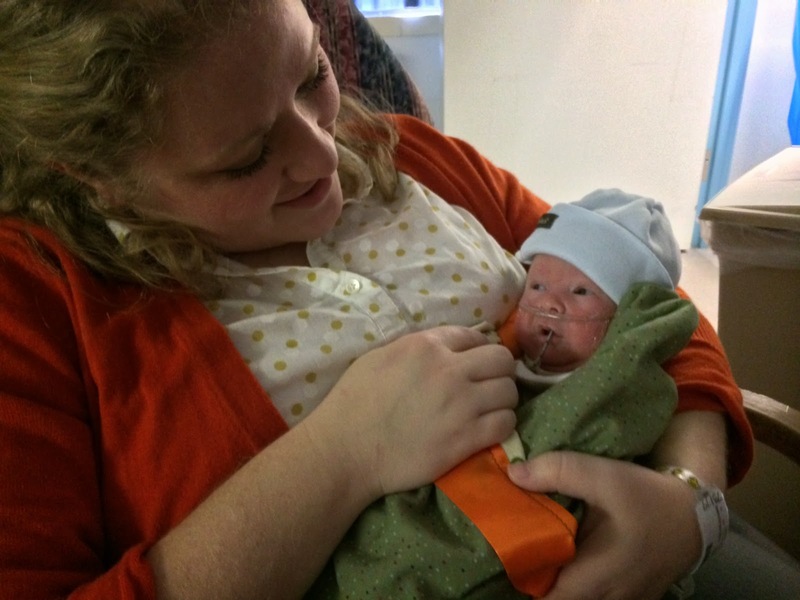 Our holiday plans were to eat something that didn't require us to cook and then to spend as much time as possible with Isaac at the NICU. We did both. We ate at a fa-hancy hotel downtown that was having a brunch with a mile-long menu that makes someone with gall bladder issues tremble, but it was great! And their stuffing really did taste good -not quite home-made, but also not too hotel-made, you know? The only thing that I didn't quite think through was that we had to be there at 11:15, and this was going to be our dinner, because well, I wasn't planning on cooking that day. This was a mistake because I am one of the many Americans afflicted with a serious condition known as hanger (rhymes with anger). With this condition, attacks of serious hunger present as anger, they can be sudden, severe and the only sure remedy is food. Now. The nurses have noted that Isaac also has all the warning signs of hanger, so clearly, this condition is genetic. If anyone were the spokesperson for hanger, it would be Ron Swanson. So much for not cooking, but I didn't mind. Like a couple of deadbeats, we hit up Randalls at 5:30 pm on Thanksgiving. In less than an hour we were eating glazed ham (this recipe, thickened on the stove because it was faster) and green bean casserole in all it's MSG glory. And it was wonderful. And now we have leftovers, the one thing swank hotel buffets don't include. If you live in part of the world that doesn't sell Blue Bell Ice Cream, I am so sorry for you. You've actually never had ice cream before. I know you are rolling your eyes, but before I was a Texan I thought the same as you that Dreyer's or Edie's or Breyer's or Blue Bunny was good enough. It's not. And now I'm not even sure that homemade dessert is even necessary on Thanksgiving at all because of one particularly delectable flavor. Seriously, it's making me question everything I thought I knew about Thanksgiving dessert. 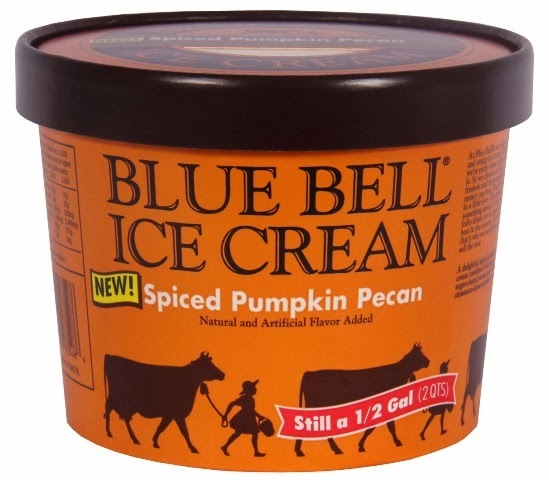 From the package: A delightful spiced pumpkin ice cream combined with tasty sugar-coated pecans and a rich cinnamon-honey-praline sauce. It's like all the Thanksgiving desserts rolled into one. 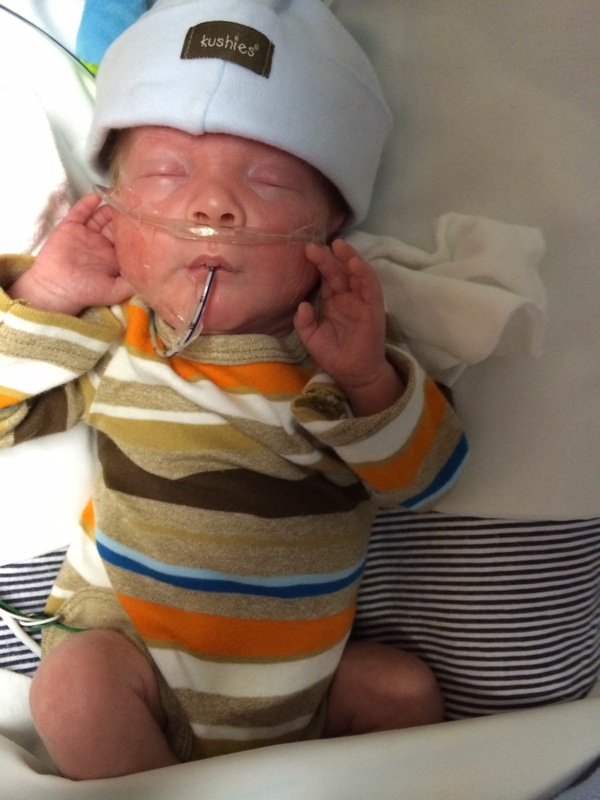 Topping our thankful lists this year was this little guy. This week Isaac was officially downgraded from a level 3 NICU baby, to a level 2 baby. And they moved his isolette closer to the door! His medical team is careful not to make promises they don't know that they can keep but I feel confident saying we've definitely passed the half-way mark. 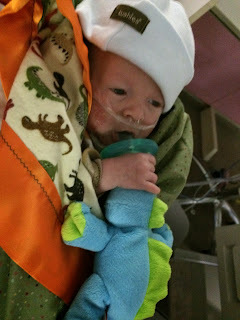 Last night he weighed in at 4lbs 10 oz, which means he's doubled his weight in under seven weeks. Most impressive. A close second in the gratitude department was for all of you. 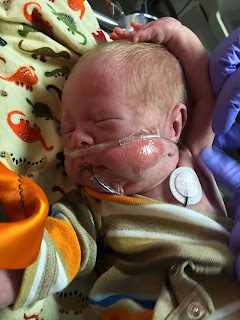 Your thoughts, well-wishes and especially prayers have certainly been what we have been depending as we've navigated this fall which has felt like one long hospital stay. Oh, wait, that's because it was. Seriously, we couldn't have done it/keep doing it without the prayers and for that we are so grateful. We will be including you all in our Mass intentions throughout Advent as we prepare our hearts for the Christ child's coming, and our home for Isaac's homecoming in the new year. For more Thanksgiving weekend takes, go see Jen. Look at his tiny little face! And that blondie blonde hair! What a cutie! Have you tried the Peppermint Blue Bell? Or the Christmas Cookie (too sweet for me but my kids loved it)? I haven't tried peppermint yet, but I am partial to Christmas Cookie...especially when they offer the limited run of the flavor in July! Anne! He looks great! Keep up the good work! He's a blessing &miracle. God gave Isaac to the perfect and most loving couple. He looks fabulously handsome. Continued prayers for Isaac and his wonderful parents. Im thankful for this update. Keeping the prayers and love headed your way. Those pictures are just too cute. I love the last one with the binky. Lots of prayers headed your way.